Grew Up… in a quiet fishing village on the coast of Sierra Leone. The country was peaceful during Solomon’s childhood, and he’s still struggling to wrap his head around the increasingly violent campaigns that are waged for control of the country’s diamond fields. Living… as a prisoner in the labor camp of the notorious warlord, Captain Poison. 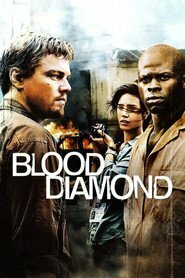 The warlords of Sierra Leone have kidnapped and enslaved their countrymen in order to put them to work in the diamond mines, as the valuable stones offer the easiest way to fund the warlord’s bloody campaigns. Profession… former fisherman but Solomon has been thrust into extreme circumstances. While working in Captain Poison’s diamond mind he discovered an huge, pink diamond – an extremely valuable stone. Upon learning of the diamond, Solomon is approached by the gruff smuggler Danny Archer who makes him a tantalizing offer: help him find the diamond, and he’ll help Solomon find his missing son. Interests… his family. Solomon’s life has been turned upside down by the war, and all he wants to do is return things to the way they were. His son, Dia, has been brainwashed and turned into a child soldier serving Captain Poison. Desperate to reunite his family, Solomon will risk everything to find his son and bring him home. Challenge… to locate his son and bring him back home. But this task is more difficult than it sounds: first, Solomon will have to find his son in a country where millions of people have been displaced. Then, he will have to go into hostile territory and reverse the brainwashing that turned his son into a child soldier. Unable to accomplish the task alone, Solomon will have to trust the unscrupulous Danny Archer to help him regain what he has lost. Personality… decent, kind, and loyal, Solomon Vandy cannot understand what drives the warlords that are destroying his country. Still, his good nature should not be mistaken for passivity. Solomon will do anything, and face off against anyone, to return his life to the way it was before the war. Solomon Vandy's popularity ranking on CharacTour is #4353 out of 5,000+ characters. See our top-ranked characters and read their profiles.